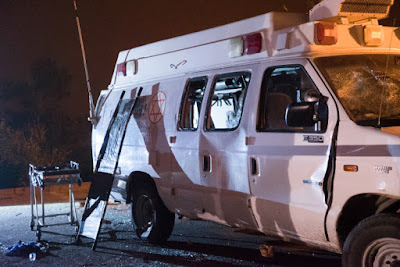 Two Israeli Druze from the Golan Heights village of Majdal Shams have been indicted for murdering a wounded Syrian after they broke into an ambulance transporting him back in June and murdered him. This is from the first link. The defendants, 48-year-old Bashira Mahmoud and 21-year-old Amal Abu Salah, can be seen in video of the attack beating and stoning one of the wounded Syrian men as he lied motionless on the pavement outside the ski village of Neve Atib on the night of June 26th, the indictment states. The indictment details how the ambulance carrying the two Syrian men – wounded in fighting in the country’s civil war – was passing through Majdal Shams at 9:15 p.m., escorted by a military police cruiser, when it was blocked by an ATV, after which dozens of locals approached the ambulance and began checking who it was carrying. The military police told the crowd the wounded men were IDF soldiers, but the mob did not believe them and began to pound on the vehicle, shattering the back windshield. The ambulance driver and the military police managed to flee towards Neve Atib where they stopped in the parking lot of a local hotel awaiting approval to continue on. After a few minutes, an IDF vehicle with troops arrived, as did dozens of Druse villagers, many of them wearing masks and carrying sticks and poles and stones. They then blocked the vehicles in and charged the ambulance, tossing aside the IDF soldiers trying to protect it. The soldiers fired in the air and managed to scatter the mob temporarily, but they returned and pulled the wounded Syrians out of the ambulance through the shattered windshield and began to beat them with metal and wooden sticks and stones. One of these was Abu Salah, the indictment states, who “repeatedly and with great force beat the wounded in his upper body with the intent to kill.” He also threw a stone at the wounded man, while Mahmoud “approached the wounded man and hurled large stones at him with great force repeatedly,” with the intent to kill, the indictment states. Both of the defendants were allegedly caught on video attacking the men, according to the indictment. Israel places greater value on Arab lives than the Arabs do.